Naomi Beseech founded this church in the 6th century and she gave her name to the thriving town of Kilbixy that was once in existence in this area. Lord Sunderlin built this present church in 1798. In the 1960’s the ceiling of the original church collapsed and it was considered beyond the means of the parishioners to restore the elaborate ceiling. The result is that the building has been divided into two parts, one part forms the present open courtyard and the remainder was re-roofed to form the church. Beside the church are the unique ruins of one of the few leper hospitals in Ireland. The ruined walls of this hospital are four feet thick with two large window openings – a structure similar to the keep of a Norman Castle. Beside the church, is a Mausoleum built at the same time, with a vault underneath the floor where four of the Malone family are buried, including Lord Sunderlin and his brother, the celebrated literary expert “Shakespeare” Malone. 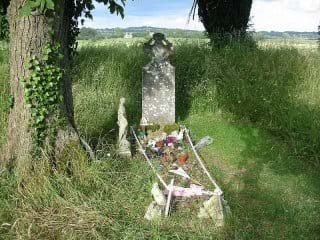 Kilbixy Church, Mausoleum and churchyard are well worth a visit and are very well maintained (permission is required from the local church official). 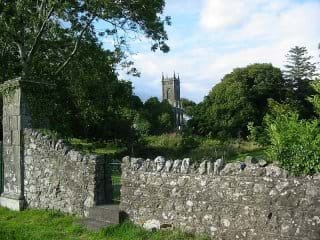 It continues to be a place of worship for the Church of Ireland and both the church grounds and graveyard are in pristine condition. Geoffrey de Constantin founded this important monastery in 1192 a.d. and granted a charter of lands, Churches and liberties. 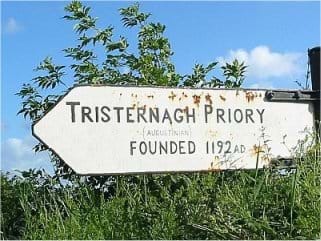 Tristernagh derived from the Irish word Tristearnagh, ‘a briary place’ is situated in the old parish of Kilbixy just two miles from Inny River Lodge. It lies just over one mile from Kilbixy and to the south of Lough Iron. Although in ruins there is an enormous amount of documented history and description of Tristernagh. Historians have found it difficult to date the foundation of Tristernagh Abbey. Earliest documents suggest that Simon bishop of Meath granted a charter licensing the building, which suggests that the Abbey could have been built sometime in between 1190-1210. In 1200 Sir Geoffrey Constantine granted to the Canon of Tristernagh, diverse liberties and privileges which among other things included diverse gifts of land, a water mill in Kilbixy and another at Balrothery with two fisheries. Tristernagh Abbey and Kilbixy Castle had a strong political influence on the colonization process ‘they were like two spearheads on a vexed frontier’. All canons were of Norman stock and therefore had strong Norman influence on the area. 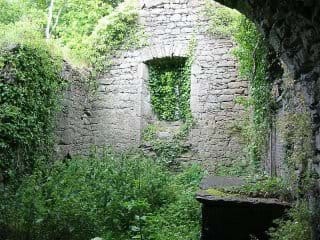 The petit Delamars, Tuites,Laceys, Nugent’s and Flemings were among the chief benefactors of the priory and were the prominent families in the early days of settlement. In 1536 when the commissioners of HenryVIII presented themselves at the priory gates they ejected the canons and closed the gates on them forever. The place was ransacked, the gold and silver vessels used for church ceremonies were carried away and furniture confiscated. Local legend has it that a great bell was taken and thrown into Lough Iron so Henry VIII’s men could not confiscate it. The last Prior at Tristernagh was Edmund Nugent, Bishop of Kilmore, who became Prior in 1530. Nugent and five canons were promised a pension from the crown. The five canons received the living of the churches of Ratheaspagh, Kilbiky, Tristernagh, Sonnagh, Kilmacnevan and Imper. During Nugent’s time a prior, O’Doherty of Connaught, with his 600 followers and forces are said to have encamped on a hillock nearby. O’Doherty gave ground to the Queens forces and retreated in the hope that Nugent who had sheltered him before might do so again. On seeing the Queens forces at his heel, Nugent refused entry to O’Doherty. This resulted in a massacre under the walls of the Abbey where few escaped. In 1567, Captain Piers, a distinguished soldier and great favorite of Queen Elizabeth captured Shane O’Neill. Piers received an award of one thousand marks for the part he had taken in the assassination. In 1583 Piers was granted a life pension on account of his wounds and retired to Tristernagh. He died in 1603 and the Tristernagh property descended intact until it was in the hands of John Piers in 1850. Sir John Piers was the reigning Lord of the Manor in 1807 and he tried to ruin the marriage of Lord and Lady Cloncurry. On 19th February, 1807 the celebrated trial of Cloncurry’s V’s Piers commenced in the court of the Kings Bench. Piers did not appear at trial, damages were laid at damages were laid at £100,000. Piers fled to the Isle of Man, the law caught up with him and he had to pay all he could. Ruin and misfortune overtook John Piers and his estates were sold out. Tristernagh Abbey is in the ownership of the Franciscan Friars and there are no plans for its restoration in the near future. The Malones, one of the ancient families of Ireland, moved to Baronstown from Athlone, in 1673 and built a mansion there adjacent to Kilbixy church. This early mansion was demolished by fire but the family rebuilt it and continued to live in the house until the early 1930’s when it was formally handed over to the Land Commission. The land Commission demolished the last Baronstown House in 1937 leaving only the water tower and an icehouse.